We use your own photos, logos, and text along with our photo effects to create customized cover artwork that represents your unique vision. We do not use templates as everybody else, so your CD, DVD, Photo Album will be indeed unique. A mixture of different effects on your pictures and texts. Personalized texts make this DVD cover yours. 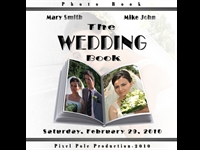 Photo Book Cover (or Front Page)- Film Strip.